LIMITED EDITION Box of Beauty Secrets. Travel collection of 8 Key Products. I*Light is the only eye treatment you will ever need and it will become your #1 favorite product. It offers quadruple action. Unique blend of natural oils and plant extracts instantly smooth out fine lines and wrinkles, de-congests and lightens the eye area, instantly minimizing visible under eye shadowing and puffiness. After 4 weeks it visibly reduces fine lines and wrinkles, dark circles and puffiness. Calming and restorative, rich in antioxidants provided by a cocktail of superberries like Goji, Raspberry, Pomegranate, Cranberry and Blueberry and rich in Vitamin C, I*Light fights skin damage and cellular oxidation that causes premature aging, by excessive free radical activity. Combination of Kojic Acid and Milk Thistle repair sun damage and sun spots, hence improve and brighten up overall eye area, while Caffeine, Horse Chestnut, Arnica, and Ginkgo Biloba improve blood circulation acting as decongestants, reducing water retention, shadows and puffiness. Adding astringent properties, they cause constriction of blood vessels, anti-inflammatory, as well as circulation boosting properties. Reishi and Caviar rich in vitamins, CoQ10 and hydrating Hyaluronic Acid help to fight aging, supporting natural skin function the best way possible, improving firmness, elasticity and keeping your eyes looking fresh, bright and forever beautiful. Ingredients: Purified Water, Organic Aloe Barbadensis (Aloe Vera) Juice, Organic Helianthus Annuus (Sunflower) Oil, Glyceryl Stearate, Vegetable Glycerin, Octyl Palmitate, Organic Cocos Nucifera (Coconut) Oil, Theobroma Cacao (Cocoa Butter), Cetyl Alcohol, Potassium Stearate, Organic Simmondsia Chinensis (Jojoba), Hyaluronic Acid, Organic Beeswax, Calophyllum Tacamahaca (Tamanu) Oil, Organic Borago Officinalis (Borage) Oil, Organic Linum Usitatissimum (Flax) Oil, Organic Oenothera Biennis (Evening Primrose) Oil, Organic Rosa Canina (Rose Hip) Seed Oil, Panthenol (Vitamin B5), Allantoin, Rosa Damascena (Rose) Essential Oil , Organic Lycium Barbarium (Goji) Fruit Extract, Kojic Acid, Caviar Extract, Rubus Idaeus (Raspberry) Seed Oil, Organic Vaccinium Macrocarpon (Cranberry) Oil, Organic Vaccinium Angustifolium (Blueberry) Extract, Actinidia Chinensis (Kiwi) Seed Oil, Pumila Mill (Apple) Fruit Extract, Fragaria Vesca (Strawberry) Fruit Extract, Coffea Arabica (Caffeine), Organic Arnica Montana (Arnica) Oil, Spirulina Maxima (Algae), CoQ10, Sodium Ascorbyl Phosphate (Vitamin C), Organic Ganoderma Lucidum (Reishi) Extract, Organic Camellia Sinensis (Green Tea), Punica Granatum (Pomegranate) Seed Oil, Organic Silybum Marianum (Milk Thistle), Organic Myrica Cerifera (Bayberry) Fruit Extract, Santalum Album (Sandalwood) Essential Oil, Organic Aesculus Hippocastanum (Horse Chestnut), Organic Ginkgo Biloba, Organic Centella Asiatica (Gotu Kola), Helichrysum Italicum (Helichrysum) Essential Oil, Hippophae Rhamnoides (Sea Buckthorn) Oil, Organic Lavandula Angustifolia (Lavender) Essential Oil, Organic Calendula Officinalis (Pot Marigold), Organic Anthemis Nobilis (Chamomile) Essential Oil, Vitis Vinifera (Grape) Seed Oil, Macadamia Integrifolia (Macadamia) Nut Oil, Sodium Carbomer, Phenoxyethanol, Ethylhexylglycerin. After cleansing and toning, apply a small amount of I*Light around your eye area (half pump is enough for both eyes) using ring finger (weakest finger, allowing the least amount of pressure). Alternatively you can use the tip/applicator of the tube for hands-free application. I*Light can be used morning and/or evening. Warning: Use only as directed. Avoid getting the product directly into the eye. Discontinue use if irritation occurs and lasts. Keep out of reach of children. Do not ingest. Do not use this product if you are allergic to any of the ingredients. Can I use it if I am pregnant? 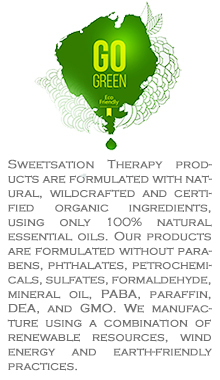 I have been using Sweetsation facial products for several years now and my face loves every one of them. I am happy to say this Eye Treatment, which I just got 3 weeks ago, is no different. It's really light. Not greasy. Goes on effortlessly and feels great. I use it in the morning and at night right after my Cucumber Day Cream and AquaTica Night Cream. I am a very happy customer! Perfect eye cream for senstive skin! Until I started using this iLight Organic, my eye lids were always puffy and the skin would be red and chapped looking. I'd always want to rub my eyes. Now that I use this regularly, I do not have any issues! It has made an amazing difference for me. I highly recommend it. Sweet therapy for your eyes! One of the first things I notice was the applicator. You squeeze a tiny dot out underneath each eye, and can rub with either your finger, or the applicator tip. I prefer using my finger, as I am able to blend in the cream into the corners and sides of my eyes easier. The applicator tip, however, is smooth and soft enough to use if this is your preference. The cream is a nice medium thickness white cream, and one of the first things you will notice, is that it smells like chocolate! A nice light chocolate scent. I suppose that is where the name "Sweetsations" comes from. I apply it in the morning routine and my nightly routine for best results. What I have noticed, is that underneath my eyes has become increasingly lighter - as in, I do not look like a walking zombie when I am not wearing makeup. Normally I need to blend in cover up underneath my eyes to help with the darkness, otherwise I look quite fatigued under the eyes. It has also started helping out with the puffiness underneath my eyes as well. I normally apply this cream underneath my eyes prior to using my regular all over face moisturizer. It takes only a minute or two to dry into my skin. After my experience with this eye cream, I am really looking forward to trying out Sweetsensation's Face Mask and Sun Screen! I feel SO much better when I use skin products with an ingredient list that I can understand (aka natural ingredients). Harness the power of Nature. I have been trying to find a product to help with my dark circles for a very long time, I wouldn't say they are really bad but noticeable so I will try anything to try and make the appearance less noticeable.... with that being said I have been using this product for 3 weeks and I have noticed that if has made the slight wrinkle under my eye less noticeable but not by too much, the dark circles are being able to be covered up my makeup better with this product but I wouldn't say it takes it away. maybe lightens it a little. I love the pump on this product. when you squeeze and release to stop immediately which in turn you don't waste any product. make the skin nice and smooth which is a plus. This stuff is awesome! It goes on smooth and is not greasy at all. It absorbs right in but always leaves my eyes moisturised. I have very sensitive eyes and most products either irritate the skin around my eyes or migrate (somehow) into my eye and causes burning in both instances. I've never had either issue with the all natural ingredients. I have purchased this many times and will continue to do so. I highly recommend it! Wonderful for eyes, refreshes, reduced puffiness, and doesn't sting! As long as this product is available I will buy it! It is so good to have something for your eyes that doesn't sting at all if you get in your eyes, noticeably takes out puffiness almost immediately, and is very fresh feeling. I also buy the sample size for my travel bag. This is the best eye creme I have ever used, and I have used a lot! I am not a huge fan of the packaging; I would be happy if it was changed, even though it does cut down on waste left in the package after you can no longer get it out. I have a difficult time with the pump. I have tried different products because of this, but keep coming back to this one because it is so much better. Worth the trouble! I agree with the other reviews. This is the only eye product needed. I won't go back to drug store brands or even name brands. This significantly reduces puffiness without making my eyes water. Love it so much! I have had puffy eyes because of allergies as well as living the college life and getting no sleep. This brings it down dramatically. It also lightens up the skin under the eyes. This is the only product i use for my eyes. Thank you sweetsensation! !